Here is a definite list of items that every global traveler. 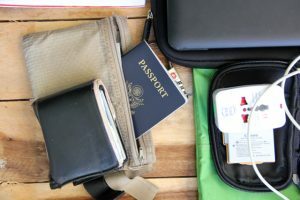 This list includes the absolute must-carry items as well those that will cushion the economy-class flight. It will also not be complete without the items that could tide you over should your bags fail to make it in time or get lost when you reach your destination. Let’s look at the basics first. The first item is the passport, since, without it, you won’t be going very far. The next is your wallet, that contains your cash and cards. A minimum of two cards that will allow cash withdrawals. Another is the printed itinerary that includes all your flight details, car reservations etc. The basics end with your phone, eye drops, eye mask and ear plugs. Others will depend on your needs like eyeglasses (or contact lenses), lip balm and face wipes. Make a list of these and buy everything you need from a discount website. The extras are what make the flight more pleasant. The first item to include here is headphones. Ideally, a pair of proper noise-cancelling earphones will help remove all cabin noise and allow you to either watch/listen in peace or sleep. Alternatively, a pair of in-ear headphones will reduce external noise enough. The other item is a tablet with entertainment already downloaded. Connect the headphones to this and you have hours of entertainment to keep you going. Pack a battery pack and a charging cable to keep it running. All of these items can be purchased for affordable charges when you go online discount shopping. Lastly for overnighters, pack everything from a phone charger to toiletries, socks, underwear and clothes. Costbuys is a new spin on the online shopping portal that aims to take the stress out of placing your online orders.